activate schemata by facilitating conversation around the general topic. concept-check to ensure that learners have understood the title and the genre before tackling the details and inferring author’s intention. Our fear is that the candidate will miss something key and not ‘get it’. What can we do? Burgess and Head’s ‘How to Teach For Exams’ (2005) offers tips for strengthening candidates’ grasp of the ‘nuts and bolts’ – in particular, question format and task types, not to mention text coherence and vocabulary inference. Petrie (2017), however, has found that practice alone doesn’t make perfect: mock exams enjoy high face validity but aren’t necessarily linked to better outcomes, unless targeted and aligned to clear learning aims. One often-missed step is fundamental learner training. While IELTS course participants (and even some teachers) expect quick fixes, short-circuiting the need to work on language, the most valuable intervention we can offer is to develop the same lifelong language learning skills that will stand them in good stead, whatever their goals. Here are some ideas to take learners on the journey towards being knowledgeable, confident IELTS readers – General or Academic. Technique 1: Do you even read though? Extensive reading delivers tangible, empirically-demonstrated benefits. We fear that, unless we tightly control the material, learners might gravitate towards what they know and like, not what is aligned with exam content (Maley, 2010). But evidence shows that ‘free voluntary reading’ is associated with gains in the spectrum of language learning outcomes – not solely reading speed, skimming and scanning (Krashen, 2004). Do you follow a blog or a website in English? Do you read fiction in English? On your commute to this centre, do you read in English on your phone? Do you follow any Facebook or Twitter feeds in English? Do you read the news in English (from a newspaper or news website)? When you listen to English language music, do you ever search for and read the lyrics? Once the survey’s complete, it lends itself brilliantly to the extension activity of writing up the results as an Academic Writing Part 1-style ‘describe the table’ task. But more immediately, it gets learners reflecting on their reading habits. Without fail, learners agree they should be reading more – OUTSIDE class – and are receptive to ideas. I use the moment to introduce learners to easily-integrated, accessible reading options: inspirational Facebook pages such as ‘Humans of New York’, Genius.com for song lyrics – or offer to identify options based on learners’ hobbies one-to-one. The opportunity is there for learners to share their favourite sources of English reading, too. You can ‘task’ learners with building a reading portfolio, or set a formatively-assessed task, but in terms of building a sustainable, long-term habit, it’s more about showing what’s out there and ‘normalising’ reading in English, less about coercion. Harmer (1998, 70) describes Prediction as ‘a major factor in reading’, but without general knowledge, we can’t predict. Teenagers looking to study abroad might know words like ‘trade unions’, but might not know anything about industrial relations. Learners of any age might not know (or care) about the difference between nationalised and private public services. The team setting the questions presumably try to minimise ethnocentrism in IELTS, but inevitably both the General and Academic Reading papers favour those with good general knowledge – the more widely-read you are when it comes to the news, the more resources you have to draw on for inference. Post five IELTS Reading passages (of varied topics) on the walls. Organise learners into pairs – preferably choose a combination that will be very talkative and (where possible) from different professional backgrounds. sentence!) Who / what body is mentioned second? Do they agree or disagree? This task focuses attention on the range of possible issues and actors. If taught before encouraging learners to find current news stories, it can demystify whole sections of newspapers – and make extensive reading more accessible. Skimming, scanning and reading for detail are basically what IELTS Reading tests, but to many learners these are abstract ideas (Thornbury, 2011) – surely what matters is reading fast enough to find all the answers? But with up to 2750 words to blitz through in 60 minutes, and given the task design, skills do matter – whether learners realise they’re engaging them or not. Distribute a question paper with 9 questions – 3 questions per text (Texts 1, 2 and 3) – each with four possible answers (A, B, C, D). Of the 3 questions, one is a Skimming question, one is a Scanning question and one is a Detailed Reading question. Display Text 1 on the screen for 30 seconds and no more. Switch immediately to Text 2, then after a further 30 seconds to Text 3. Show each text 3 times in total – then off. Learners are often surprised just how much they could locate, and become aware of where they need work in developing those skills. In particular, many (even stronger) learners will answer a Scanning question with the first of the ‘distractors’ that they spot, without checking the full context – a useful lesson at this stage on the nature of distractors. Similarly, for Detailed Reading questions, learners often fail to spot negatives or contradictions when working under pressure – a good opportunity to raise learners awareness of these features. The second, and more exciting (but stressful! ), variant of this is a Reading Conveyer Belt. Post the texts (printed out on A3 – make it large enough to read from some distance) around the room. Learners answer the questions on the question paper, but may not stop moving – they have to continue to walk in a circle around the room and are not allowed to stand still to read! Learners often find True / False / Not Given questions particularly stressful, even when they’ve conceptually mastered the crucial F / NG distinction. Very often, this comes down to lack of confidence in their own judgement, or a sense that, having read at speed, they might simply have missed something. Put learners in teams of 3-4 members. Give them 3 flashcards to hold up: True, False, Not Given (or 4 with A, B, C, D if practising with a different section of the test). Distribute texts and allow 30 seconds to skim for general meaning. Give up to one minute to find the answer individually through silent reading. Allow thirty seconds to agree the team’s answer together. On the count of 3, all teams hold up their True / False / Not Given flashcard. Whichever teams have the answer correct score one point. Play as many rounds as there are questions. Learners are often surprised to discover how similar their reasoning and processes of elimination are. In particular, they receive crucial reassurance that their judgement of Not Given is often correct. Knowledgeable, confident readers needs knowledge and confidence! So much reading training is just ‘doing’ reading. The general knowledge and confidence dimensions that immunise learners against rabbit-in-a-headlight syndrome under exam conditions ends up neglected. But it can make a real difference in journeying from passively suffering IELTS reading to being an active, confident IELTS reader. Burgess, S. and Head, K. (2005), How To Teach For Exams, Harlow: Longman. Harmer, J. (1998), How To Teach English: An introduction to the practice of English language teaching, Harlow: Pearson. Krashen, S. (2004), The Power of Reading: Insights from the Research, Santa Barbara: Libraries Unlimited. Maley, A. 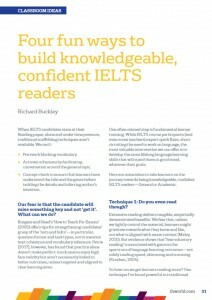 (2010), ‘Extensive reading: why it is good for our students… and us’, British Council TeachingEnglish, available online at https://www.teachingenglish.org.uk/article/extensive-reading-why-it-good-our-students%E2%80%A6-us (accessed 01/11/17). Nuttall, C. (1996), Teaching Reading Skills in a Foreign Language (2nd edition), Portsmouth: Heinemann. Thornbury, S. (2011), ‘G is for Gist’, An A-Z of ELT: Scott Thornbury’s Blog, available online at https://scottthornbury.wordpress.com/2011/11/27/g-is-for-gist/ (accessed 01/11/17). Richard Buckley is Corporate Programmes Coordinator at British Council Sudan. Since completing his CELTA at IH Newcastle, he has also taught in Indonesia and Japan, as well as completing a Master’s in Education and DELTA Modules 1 and 3. His main interests are Business English and needs analysis for corporate clients. He can be contacted at: richard.buckley@sd.britishcouncil.org.